Sorry I haven´t been replying emails or posting here. These last couple of weeks were too short and chaotic. So, I received a lot of offers from many different music and pixel artists, and I mean A LOT. I think the project has gained some popularity since last year, there are many talented artists out there and many of them offered their help. I gave a couple of test assignments to some people, hopefully by the next update I´ll be able to annouce the new spriters and musicians. In the meantime, the project has advanced a little. Right now I´m making all the caves that connect the main areas, and the new and mysterious area 5. Thank you very much for following the project, for your comments and for your support. I´ll do my best to make 2010 the year when AM2R is finally released. I wish you all a Happy New Year, have fun and be safe! Doc, as I said before. When you finish and release AM2R, I hope you and everyone that helped you with this project get the recognition you guys deserve. 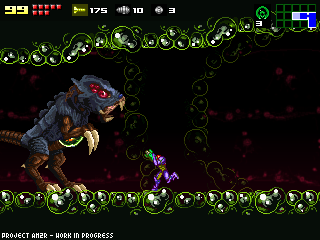 I played Confrontation(the Metroid tech demo)and I just knew that your remake of Metroid 2 will be the best. Doc, I hope you have a very Happy New Year. I really hope you choose the most talented artists and musicians. Please pick some real Metroid fans who know what's Metroid about so the game doesn't get too colourful/wacky if you know what I mean. Choose only the ones who really catch that eerie "metroidy" feeling :D.
Merry Christmas! I can't wait to see who you chose! I can't wait for this game to come out!!!! Firstly, merry christmas for all. I have seen your videos and the game looks awesome I just have a complain. Some of the enemies (like arachnus) you took the sprite from metroid fusion are pink, but i think you know that every enemie in fusion is pink because of the X parasite, keep that in mind. Merry christmas and a happy new year, good work. I almost sent you an e-mail offering my help as a musician, but I'm still learning, and I'm not quite up to the standards this project seems to have. Nevertheless, good luck, and Happy Holidays to you as well. Well you already know I'm available. I beat a lot of people want to help, this is a very important project. To all of us. Whoever you choose, may it be the right decision and good luck to AM2R, and also may many a fan boy rejoice when it's completed. "Well you already know I'm available. I beat a lot of people.."
"Well you already know I'm available. I beat a lot of people want to help..."
Yeah I noticed it, after I posted it. I've been watching this project for quite a while now, and I'm really impressed at all the progress you've been making. And I'm really looking forward to the finished project. merry christmas and happy year for all!!! Ojala que termines el juego para este 2010. Great work so far, looking forward to the finale! Can't wait to see the new sprite artist's contributions and the new audio...But PLEASE keep the existing music you've used so far--its much better than any of the OFFICIAL music on the DS and GBA games. Have a nice New Year! I'm a bit surprised that there's going to be a new Area 5. Is it going to replace the 'Fight Alpha, loop around and fight Omega' segment and have a whole new batch of metroids and everything? Or is it something else entirely? Sweet!! One more year!! Keep up the great work and let's pray to GOD that Nintendo doesn't snuff the project out like what they did to that fan-made Zelda movie that took 4 YEARS to make. I just discovered AM2R, and I though it would be another crappy fan game like so many but, HOLY CRAP! I just tried the tech demo and I loved it! Espero que tengas un mejor 2010! -Metroids: Please consider making the metroid movements more erratic rather than floaty/slow-accelerating, while perhaps bumping off you instead of staying at your coords (more important if floaty). Also include some more unique, maybe partially random behaviors. The more you can include those in non-robot enemies (esp. m's), the better. They're animals, not evil, predictable beings. Robots, on the other hand, shouldn't just be drones either. -Samus: I never liked the look/feel of Samus in the advance games, fusion/zero. Consider slower gravity, and a less stiff-hunched look. Essentially, she looked that way when she stood and ran, while previously it seemed more upright, which was more appealing to me. Another option is to make her only like that when she stands, but make her more flexible when she runs. Just looks kinda unnatural somehow right now. -Controls: Consider a more traditional option for controlling missiles. I never got used to holding a button for it and never liked it. That being said, we're using a computer and could have separate toggles for each weapon. Don't worry about something like having many keys killing the feel, of course. More options are better. Lastly, it's been a good while since I've looked into this project. Is there a better place to find general information and discussion rather than merely updates? I might like to help map out AI pseudocode for random enemies. It was my dream to be able to do something for AM2R since I saw it two years or so ago. One of the reasons I began spriting was because I saw this fangame and it inspired me to do something. So if you ever need anything (sprite related), I'm open. It's interesting, there seem to mostly be two breeds of Metroid fans. Super Metroid fans, and Metroid Fusion fans. While I can respect the exploration and originality of Super along with the awesomeness that it still holds up so many years later, I think there are a few leaps forward in Fusion. Neither game is perfect by a long shot, but I wouldn't try to totally exclude either when working on a new project. I'm pretty much indifferent about the gravity myself, but at this point I severely doubt it will change from the Fusion style gravity. IMO, SM had terrible controls. No amount of customization could account for the fact that scrolling through 5 things in a boss fight = death. Nor could customization fix the fact that you would often need to hold down 3-4 buttons at a time. I truly think that the controls are by far the thing holding back SM the most. I have nothing against toggle missiles, (Especially if you don't have to scroll through other items on the same button.) and I guess a few people liked the Super style controls. But, I do think the game should have more customizability to it's controls than SM. It's not like we are limited to a gamepad, we have the entire keyboard to work with. If someone wants to use a different button for every single ability and never have multi-function buttons or toggles, I think you should let them. I hoped that I could help, but no luck for me. Hopely there are people who are good and know what means metroid. Happy holidays to you too, and to everyone else! Hope this is out soon, this is a really fun game! Hey guys, come check out my Metroid game! We're not as far as 'The Doc' but we've made some good progress. The site is: www.metroid-escape.blogspot.com, check it out! I Can't Wait For AM2R! I have a competition running for people to design me a blog banner that I will use on my blog! Btw, keep up the awesome work Doc! Other names como to mind like "Metroid Planet" or "The Last Metroid", but they don' feel as metroidy. Actually, I like "The Last Metroid" quite a bit, as it not only tells you what the game is about, but ties into the sequel. en que fecha lanzaras este juego? No tienes una fecha aproximada para el lazamiento? Personally I think "The Last Metroid" would be more of a name for Super Metroid. While yes Super Metroid refers to the Super Metroid, it was actually the Metroid Hatchling from M2 which would then make it the Last Metroid. I'm also a little confused as to why a name change was even brought up. DoctorM64 said the name wasn't final several blogs ago. However, I've come content with AM2R. "The Last Metroid" Is okay, definitly nothing wrong with it, but why the change at this point? Hmm. I think the name AM2R is pretty much what people know as the name of this project. Changing the name would create a lot of confusion. Perhaps the words that AM2R stands for could be changed slightly if people don't like the name. Instead of saying "Another Metroid 2 Remake," maybe it could just be "A Metroid 2 Remake" instead. If any of these have been used, note I don't follow most other metroid projects. AM2R is "Another Metroid 2 remake" or "A Metroid 2 remake"??????? "Project AM2R - Another Metroid 2 Remake"
Metroid: Mission 1, somewhat in line with "Zero Mission". Or Metroid: Gestation -- to emphasize the organic feel that I know you will put into the game. I CANT WAIT FOR AM2R!!!!!!!!!!!!!!! It's not your fault if some other fangame maker picks a very obvious title being the place of battle. i totally don't see how it'd be so important to keep the same name. To make a good project complete, part of it is giving it a good name. It will gain popularity just fine. Furthermore, you can always make a subtitle underneath that says "AM2R" or "Another Metroid 2 Remake" just so ppl know exactly what it is. That's really what should be done. But that as the name itself, no matter how used to it some followers are, is not a good name, and not worthy of the work put into it. In fact, it makes it sound like it's poor quality. As for while this is still a project, you should keep AM2R at least as part of the name, of course. Hey Doc, random thing I just noticed. You know how you said you changed the tiles from having an outline awhile back? Well, shouldn't that mean you should change your banner, since it no longer has that outline. It's looking good but I just hope that the final product gets some additions rather than just be a straight replica of the original, albeit updated. Hey doc, how about "Metroid:SR388 Assault" or "Metroid:Extermination" for the name? I just thought of this, but I think it would seriously help you with an earlier fear you expressed. You said you were struggling with how to keep things fresh near the end of the game with Samus being a walking tank. I think you could fix this by making the final areas rich with environmental hazards the likes of which no one would expect. Make yourself a sort of organic ninja mansion. More difficult environmental hazards late-game do sound quite fun. -Enemies with very high damage that also move quickly but can be taken out quickly if you spot them first. -Hidden vines which grab you when you get close similar to an infant Metroid and require ice beam to freeze them. -High powered lasers that fire at static locations. Even better if enemies can be lured into them. Will the charge beam have the ability to pull in items, like in the Prime games? Will there be any extra ability's? Like you know how you you put the charge bomb, well maybe you could be a little creative and think of a little extra things like, what if you set off a bomb whilst ball sparking? You know, something new. Will the regular bombs in a dark area have there own light glow? Like how you did with the beams? Will there be any special characters like in Super Metroid? Will there be a sprinting button? what about metroid 2 sibling rivalry, because both samus and the metroid are the chozos "children"
What would be cool is if you posted a part of every song you've received, so that we can comment on them, give some feedback on what feels Metroidish and what doesn't do it for us Metroid lovers. Maybe as a youtube clip featuring gameplay, so that we get some feel to it. "A Metroid 2 Remake" is a bad name. I know it is intended to be red as "A Metroid Two Remake", but it can also be interpreted as "A Metroid to Remake" implying the remake itself is in need of a remake. I like "The last Metroid", it's something familiar to us, and it relates to the storyline of the game. But what would make that title even better, is if there was another area after Samus rescues the Metroid, where the Metroid protects Samus, and Samus protects the Metroid... like a deeper reason for why the Metroid gets attached to Samus(as shown in Super Metroid). Or maybe that the Metroid hangs around Samus(like the Familiars in Castlevania), helping her escape during an obligatory count down sequence. Maybe you could change the title but still find a way to include the letters AM2R. You could do something like Metroid AM2R: The Last Metroid. I liked the name "The Last Metroid"
This must be a great remake!! One question: when it will be ready? errrr... the name "The Last Metroid" doesn't make any sense, there are quite a few metroids on sr388 by the time samus gets there. I like the name "AM2R: The Last Metroid"
To the guy who said the last metroid doesnt make any sense. yeah, but that doesn't happen before you finish the game. Exactly. It doesn't make sense to the CURRENT story, only the ending. It's not even a goal. It just happens, and is the setup for SM. Someone mentioned, "the title would be more fitting for Super Metroid." Yes. People just want to latch onto "The Last something" cuz they think it's epic, but it's overused anyways. January 15, 2010 8:08 PM"
what? I said no such thing. I think that's a lame attempt. As for the usual suggestions of extermination and such, I have to say that it sounds pretty crappy. Metroids are more than just some annoying bugs (that happen to be in their native habitat), and the sound of the word itself just doesn't sound right for a Metroid game. Metroid II: Homeworld is pretty good. Also Search this page for my name to catch a long list of other, different names. Well, here are some ways to justify the name The Last Metroid for people who don't think the name fits well with the game. When you say the name The Last Metroid, it kind of implies that Samus's goal is to kill all the metroids in the game. When people get to the queen metroid, they'll think of it as The Last Metroid. However, when they defeat the queen, they discover that the The Last Metroid is really the good baby metroid. I think this name will create a nice suprise for people who have never played M2 before. I'm not trying to say that other names for the project are bad, I'm just trying to justify the name AM2R: The Last Metroid. If someone can come up with a better name for the project, then that would be even better. What if the doc doesn't want to change the name? To me, Metroid Zero Mission II is the best name (Since it's done in the same graphical style) because it sounds cool to me. On the note of the "The Last Metroid", Striker X22 was right. People latch onto it because it sounds epic. "The Last Metroid" Sounds like a SM remake. It does fit towards the end, but the ending of M2 really does nothing but set up SM. The Last Metroid is not a terrible name, but it isn't as fitting as other names. Metroid AM2R: SR388 Assault is the best name I've seen so far. It sums up te stroy line, and includes the project name while avoiding the cliched name "The Last Metroid". Of course, I'm always fine with AM2R. Of course, a poll will probably settle the whole thing, but I'm sure that "The Last Metroid" will just get all the votes. Doc, the project seems to be going incredibly well, so I hope you can find the time to finish off the best fangame to ever grace the world with it's presence. Metroid Zero Mission II isn't fitting for this game at all. Zero Mission was called that because of the minimovie at the beginning of the game where Samus called it her "Zero Mission". Making a MZM2 doesn't make sense to me. However, Metroid AM2R: Sr388 Assault does fit the bill. I'm still kind of leaning towards "The Last Metroid"
"When people get to the queen metroid, they'll think of it as The Last Metroid"
Heheikki is right. Besides, it ISN'T the last metroid until you just HAPPENED to have killed everything before it, and you'd only be assuming there's no more. The metroid counter already changes on you once. I'm probably the last person to have a faith in the common man in terms of taste. I mean, people make Nickleback popular. That should tell you something, if it isn't already bleedingly obvious. Polls will likely NOT choose a good name, rather than the other way around. Certain people are artists for certain things. People have different talents. It is inherently flawed to "take an average" and expect to come up with good art, whether it's a name or a song or whatever. The mere fact that people fabricate odd, situational, convoluted reasons for why the name SHOULD fit is evidence that it doesn't. They likely weren't even thinking about their reasoning when they latched onto the name. With all that said, the author will decide. If he wishes, he can pick a few of his favorites and then poll it. That'd be much better than an all-out poll. Sounds better to me. And this is how I picture any of the titles should be somewhat like, in-game. Well StrikerX22, Heheikki, I agree. The Doc should be the one to narrow down the options to say five that he likes. Another question, just how many Metroids are there going to be in the game? 39? Hey Doc, I'm totally new this remake but I am absolutly amazed by the work you put into this. I played your demo and was surprised at how well the physics of the wall jump and other abilities were captured in your demo. I hope you and your team are close to finishing the project. I noticed there have been some suggestions about the title of your remake. How about "Metroid II: Evolution" since the whole game is about killing metroids as they evolve into more advanced metroids. I like Metroid 2:sibling rivalry, its pretty funny. Since you're all discussing the name, my "vote" goes for "Metroid: Rebirth of Samus" since the original is called "Return of Samus". AM2R: Homeworld , i think striker posted it. It is also a nice name. However, those who ask to use "assault to sr388"... It is very bad IMO, it reminds me to a fps and this is not a shooter at all. And it also make you to think of the metroids like poor creatures, but hey, they´re a threaten for the universe. You can´t look at them as helpless animals. 1. It'll grab the attention of many dedicated Metroid fans who know what that title means. Essentially, it's a homage, and homages done well are usually a good thing. 2. It's also ambiguous/ominous enough to catch the interest of those who are less familiar with the franchise as a whole. People who've only played Prime will become curious about how the Metroids are reduced from a full race to only one. "Extermination" and all the other titles are also ominous, but they only work on one level. "The Last Metroid" is clever and works on multiple levels. Still, I actually suggest keeping the "Metroid 2 Remake" in the title, so the "Last Metroid" subtitle doesn't confuse players into thinking this is your average fangame with a crappy made-up story. How about "The Last Metroids" as opposed to "The Last Metroid"? "Metroid II: Return of Samus Remade"
"Metroid II: Return of Aran"
Zero Mission II doesn't make sense. Its either Zero or Not that's like saying One Two. Those make more sense if you are going to do it like Zero Mission. Although technically I guess this would be Mission One after Zero. "Metroid II: Homeworld" is also good. I just don't like "The Last Metroid" unless its for Super Metroid. If this game was about following the Epics of the Last Metroid then fine. But that's not what this is about. Yeah I think the sound of Matroid II: Homeworld is pretty nice, as I've said before. But no, alberto, I wasn't the one that came up with that... it was some anonymous. And yeah, Zero Mission II? bleck. that's just retarded sorry. It makes no sense whatsoever.